I know I am late on the new years thing. Two thousand and TEN. I remember writing a paper in elementary school about what I thought life would be like in and after the year two thousand and I think I remember stealing ideas from "The Jetsons" and "Back to the Future." Though I am not sure we have come quite that far yet, I am excited about the new year and all of it's possibilities. Is it possible that it already seems to be flying by? Where has January gone??? 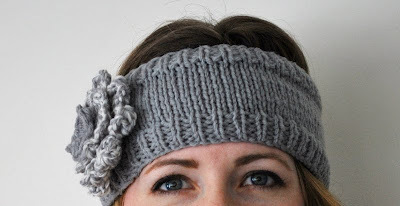 Wanna see the cutest headband/earwarmer ever that my mom knitted for me? Cute, right? I sent her a link to this pattern and voila(!). Four days later this beauty arrived in the mail. I loooove it. I hope to learn to make it on my own to give it as gifts. Click here to see my favorite free valentine printables I have seen thus far this year.